If you haven’t already heard, Josh, Nora, and I are currently traversing the USA in our R-Pod travel trailer. For the next four months, our journey will take us through much of the country, all while living out of our approximately 100 square foot R-Pod trailer. 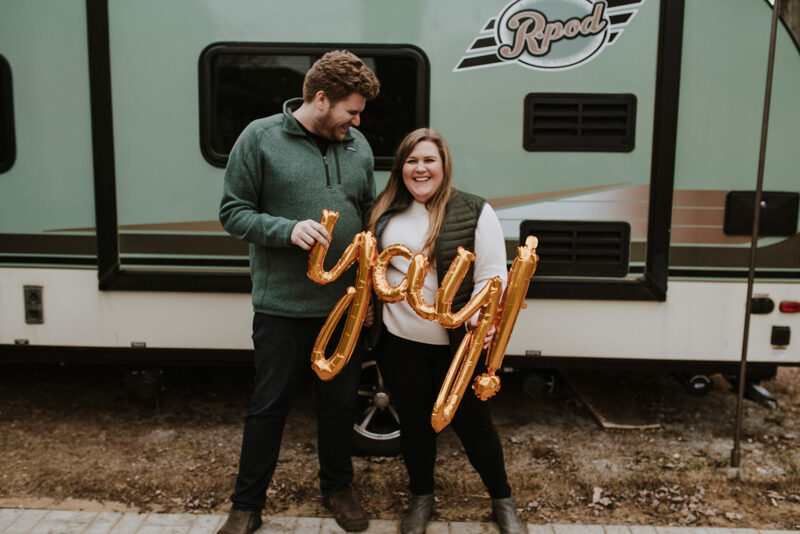 We are exactly one week into our journey and we are still getting into the groove of traveling (and working for me), but I know how quickly this time will go so I wanted to share more about why we decided on this adventure and how we were able to make it happen. For many, the whole thing sounds a little crazy. 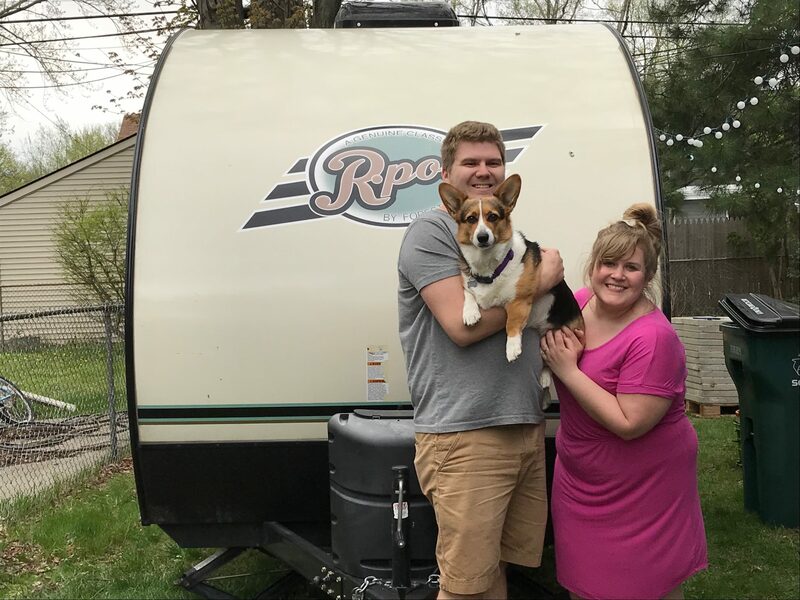 Why would two 20-somethings with a home, careers, and lives just up and quit everything to live like nomads out of a space on wheels that’s just a fraction of our home? But when we were dreaming up things we would like to do while we’re young, taking the “Great American Road Trip” was one of them. When I suggested it, I thought that we would never be able to carve out the time. To really take such a trip and enjoy it, you need months, not weeks. I know this from all of my experiences living in different cities and traveling in Europe. At the time I made the suggestion, it seemed impossible with our corporate jobs with barely three weeks vacation per year. We weren’t even married yet and I had yet to grow my photography business. But Josh insisted that we would find a way to make it happen at some point. And then things just seemed to fall into line to make this dream a possibility. My photography business kept growing, even though I started a new corporate marketing job. Josh kept on keeping on at his controls engineering job. After the whirlwind of getting married, renovating a bathroom, handling my first wedding season as a photographer, and starting a new corporate job, we asked ourselves, could we actually make this happen? I did some research and budgeting to figure out how much we would need to save and what equipment would be best for us, just to see if it was feasible. By the beginning of 2018, Josh had some new professional opportunities come his way so we had to make the decision: to go or not to go? We choose to go. This decision changed the course of our year. Josh stayed at his job and consequently spent most of 2018 either working or traveling for work, including several weekend trips or nearly two-week trips, most of which were last minute, making it impossible for us to plan anything throughout the year. At the same time, I was working in a corporate job by day. At night and on weekends, I was hustling hard on my business, determined to make it full-time ready by 2019. Despite booking 26 weddings, I choose to continue working through the year to save for this trip. I was working 80 hours most weeks June to December. But we still had this trip in the back of our minds and I had already developed a savings plan to make it happen if we were to pull the trigger. If not, I figured we would just have a lot of padding for whenever a baby would come along or if we decided to buy a new home. Unexpectedly, we luckily found a nearly-new R-Pod for sale on craigslist in the spring. We hadn’t even looked at new R-Pods (hadn’t had time due to all of Josh’s travel and my work schedule) but we decided on the spot to buy ours from a retired couple who decided they wanted something bigger. So in May 2018, we paid cash for our 2017 R-Pod 179, and had to have my dad help us tow it home using his truck because we didn’t even have a tow vehicle yet. Why the R-Pod? Why not something larger? After extensive research on travel trailers that could be towed behind a mid-sized SUV, we decided the R-Pod met our needs. We felt strongly that we didn’t want to purchase a pickup truck to drive and preferred something in the Jeep family. 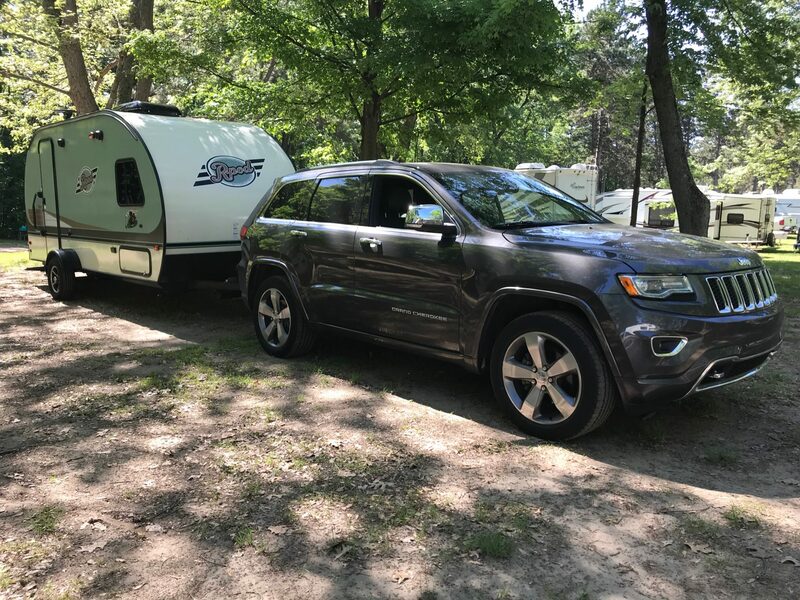 We knew that the Jeep Grand Cherokee had good tow capacity and was a good family car for the future. Also, it’s just an overall nice car to drive around. If you know me, I’m a Jeep fan, and have owned a Wrangler and have owned a Cherokee for four years now. 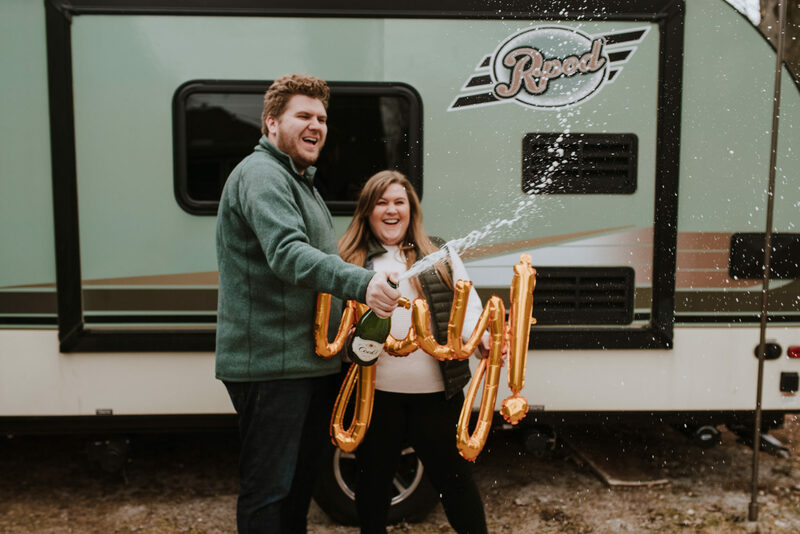 Being newer to pulling campers, we wanted something smaller and the R-Pod had a good reputation, including a tremendous owners’ group on Facebook that has been a help to us as we figure out how to be RVers. The next week, we brought home our nearly-new 2014 Jeep Grand Cherokee Overland, trading in Josh’s Ford Escape. With that, we were major equipment-ready. It was an expensive month to say the least! The day we brought our R-Pod home! We took the R-Pod out for the first time for a one night visit to Metamora State Park in June. Before the R-Pod, Josh had never towed a trailer in his life and did not come from an RV-camping family. I do. In fact, I found out that I come from a family that “boondocks,” meaning we camp without any hookups (electricity or water). My family has been camping in RVs since I was small, but I was never responsible for towing it or taking care of it. All of this was new, but we did have a great resource in my parents and the online community! Surviving a one night visit one hour away from home, we barely got the pod back into our driveway (if you’ve been to our house, you know we have a single car driveway and it’s pretty tight) and into the backyard where we have stored it since we bought it. Deciding we needed more practice figuring out how to tow the pod, we took it up north to my parents’ property in July, and spent a weekend in a campground in Holly as well. That was the last time we took it out until this trip! Each time, we became more confident towing it behind the Grand Cherokee and Josh got better at backing it into the driveway — he honestly has more patience for it than me. Taking the pod out for the first time in June 2018 at Metamora State Park. End of 2018: Would We Actually Go? As we got closer to the end of 2018, I wondered if we would actually make our trip happen. We hit our savings goal for it in November, but we both continued to work, having choose to give notice after the holidays. As I mentioned, we were both working ALL the time, so we didn’t devote much time to trip planning at all; in fact, we didn’t mention it until Thanksgiving when I checked out a few roadtrip books from the library. I drew out a draft route for a starting point in excel and found out that I needed to make reservations for Florida because all the snowbirds would be there in February, when we planned to arrive. December came around and my countdown to “quit day” as I called it became single digits. Somehow, I still thought we would change our minds or Josh would get roped into a project that wouldn’t end for months (it’s happened before). Nonetheless, I gave notice before Christmas, but it still didn’t feel real. Josh waited until after the holidays and by January 11, we were both without corporate jobs and still had the pod to get ready for our journey. For a week, we packed, improved, installed, and got our houses ready for the journey. I had spent hours researching what we might need and how to organize the inside space to maximize our storage; we do have one of the most storage-friendly pods. I managed to fit everything we need in our pod or in the vehicle. 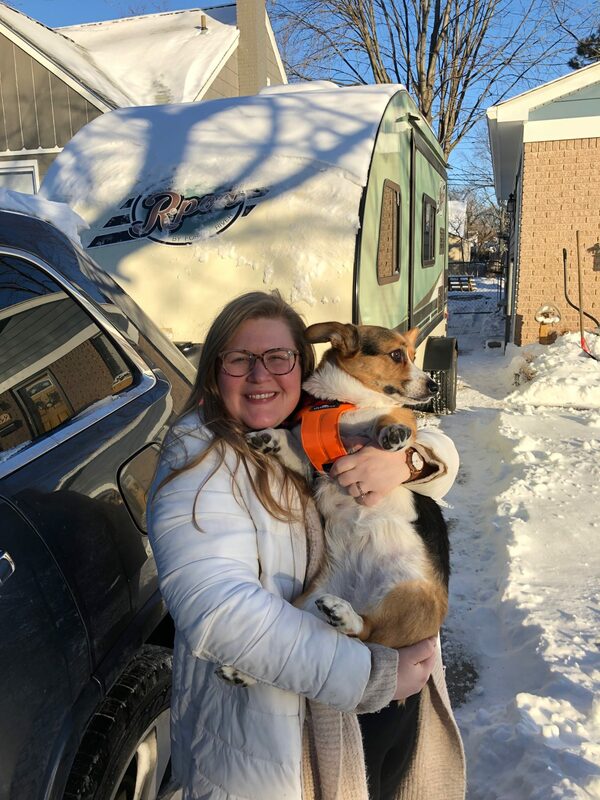 A typical Michigan snowstorm deterred us from leaving on Saturday, January 18, but our antsy selves were ready to go the next day, despite frigid temperatures and snow sweeping through the entire midwest. Nonetheless, we hit the road at about 9am on Sunday morning and finally the whole trip felt real to me. After some interesting detours through a snowy Ohio, we stuck to the interstates which were clear, but added hours to our journey. Due to freezing temps, we spent our first night in a hotel (the pod is just not made for boondocking in negative temps) and with everything liquid in the pod frozen, we pushed on to South Carolina, where it was warmer and where we would begin our journey. On Monday night, we rolled into Myrtle Beach State Park after eight hours of driving and a trip to the car wash for our salt-stained pod. As I finish this post, we are already in Savannah, Georgia, having just come down from Charleston. It’s one week into our trip and I am still adjusting to working less (though I am still working on editing, some winter season business stuff, taxes, and meeting with new clients), but Josh has adjusted to “temporary retirement,” as he calls it, just fine. Nora is enjoying all of the walks, pets from strangers, and just being with us 24/7. It seems like the nomad-lifestyle is treating us just fine thus far, despite the many mishaps (we are learning and never make the same mistake twice!). The day we left it was cold and snowy in Michigan! So why did we decide to take this trip? The whole thing was my idea (I’m guided by the principle of ‘how hard could it be?’) and being a lover of travel, I always wanted to take a year-long trip around the country to see America. Once I make up my mind that I want to do something, I make it happen. After the 2016 election’s outcome, my mindset about life shifted a lot. I no longer wanted to wait for a future that may not ever exist for us. The answer to every question shifted from “we’ll do that one day” to “why not now?” It seemed that I learned that nothing is for certain and that everything you know to be true and good could easily be wiped away in an instant. I think Josh shares most of my sentiments and was convinced that it was a fabulous idea, becoming its champion when I wanted to let it go many many times. He always pushed on and told me we were going. I think we both knew that the time was now if we wanted to do something like this. And to be honest, we would probably love to take more than 4 months if we could and if my wedding season wasn’t so long. Our hope, after a long year, is to reconnect with each other, spend time together exploring, and remind ourselves how small we are in this big world. I knew that if we waited to do something like this trip, it would have to be in retirement if we waited. We’d be older and our lives would look a lot different. But right now, we are young, and we are not (thankfully) limited by debt or children. What better time to take a moment for ourselves to explore and recharge ourselves for whatever is next? I can’t think of one. We both know once there are kids in the picture, we’ll have plenty of time to be home and settle ourselves into a routine in our community. We are both aware of our acute privilege in this situation. Not many of our peers could afford to take time off to have an adventure like this. But we did spend over a year saving our money carefully and saying no to many things that could have made our lives easier. We have the privilege of buying ourselves some time, and as Josh always tells me when I get stressed about money, “We can always make more money, but we can’t make more time.” He’s right, y’all. Living in small spaces and the digital nomad lifestyle is increasingly common: think the tiny houses revolution. There’s a whole counterculture out there (probably always has been) that is rejecting the traditional lifestyle for a more nomadic, simple lifestyle. We aren’t planning on adopting this full-time forever. We actually both really like our little house in Clawson, Michigan, having spent a great deal of time over the last three years making it our own. The more we travel, the more we find that we both really enjoy Detroit and its vibrant culture, delicious food, beautiful diversity, and proximity to the Great Lakes. A lot of people have asked us where we were planning on traveling. Our goal is to make almost a giant circle. We started by heading south to South Carolina, skipping the east (too cold for the pod in the winter) and starting where it is very comfortable, Michigan-fall-like temperatures. From South Carolina, we have traveled to Georgia and will make our way to Florida tomorrow to visit with Josh’s sister and parents, who are making their way down for the weekend. After Florida, we head west until California, and then up the coast to the PNW, then back east, down to Colorado, and somehow make it home. We aren’t sure of our exact route home, nor do we have reservations beyond Florida (except for when Josh is sitting in Phoenix for a long weekend while I go home to shoot a wedding). We have general places we would like to see and spend time in, but nothing concrete yet. Our plan is to be home by May 1st so I can shoot my first wedding of “wedding season” on May 3rd. Have suggestions for us out west where we are planning on spending most of our time? Drop them in the comments and we’ll see what we can do! Pet friendly places work best because Nora likes to be in on the fun!